If you can become familiar with an artist’s early works, especially the copies made after earlier masters, you will know what to look for in their later art because, like our own adolescent memories and those from early adulthood, the images stay with us and artists often refer back to them. Of Manet’s surviving early works a remarkable number are copies of self-portraits or images of other artists, thus suggesting that art was as interesting to him as the world itself. One example is his watercolor after what was then thought to be a Velazquez. It was said to depict a group of Spanish artists with Velazquez and Murillo on the far left. 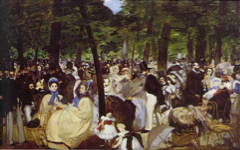 This "Velazquez" is now known to be one of Manet’s many sources for Music in the Tuileries, a group of people in the Parisian art world gathering outdoors1. Yet though the subject matter is similar, the scene far more crowded and shaded by trees looks quite different. Few people would see a link between these two images unaided. 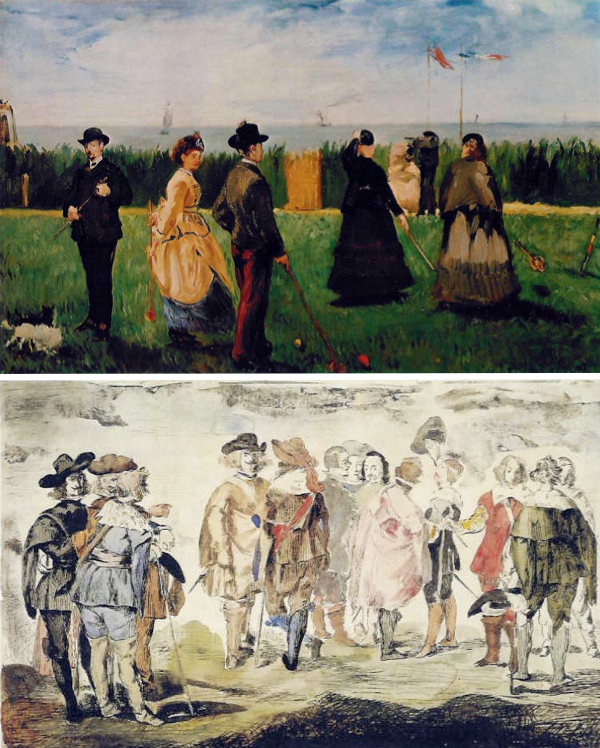 Now take a look at Manet's later painting of croquet players. Though apparently a different subject, the grouping of figures looks more similar, especially when you notice that the players are holding long, thin mallets in place of the swords. The woman holding onto her hat, moreover, is in the same spot that the cavalier in the "Velazquez" waves his hat. Despite this greater similarity, no-one has ever noticed the link. Once you do, though, you can begin to imagine that the croquet players are "artists" using their mallets as "paintbrushes" to push paint around canvas. That's why the balls, like colored blobs of paint on a palette, wait in the foreground to be used. 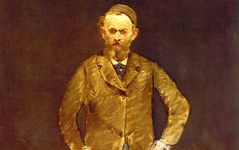 Many of Manet's paintings are similarly constructed. See Soap Bubbles, Before the Mirror and Interior at Arachon. The figure (left) standing separately near an edge of Manet's canvas looks out with his hands one above the other on a diagonal. 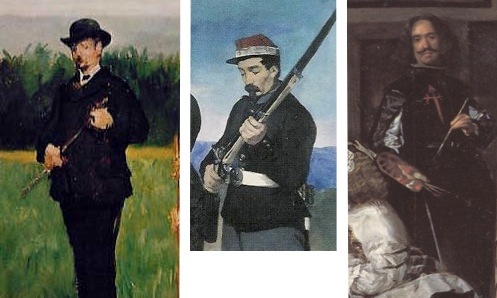 The officer in Manet's Execution of Maximilian (center), also at the edge and separated from the main group, has his hands on the same diagonal. Both are based on the position of Velazquez's arms in Las Meninas (right). Remember the pose because in Manet's art it crops up everywhere, a "brush" hand poised above a "palette" hand. This man is the "real" artist who has painted an allegorical picture of "other artists pushing paint around canvas”. The same is true of Las Meninas as I hope to explain shortly. This "artist" also wears a red sock to symbolize the red rosette of the Legion d’Honneur that Manet craved as a mark of his nation’s respect. It references the red cross of the Order of Santiago on Velazquez's chest, an honor which he too craved. Manet used this symbolism in many other paintings including The Suicide. In case of doubt, he placed a dog at the "artist's" feet in a lower corner where signatures appear. The dog's legs spell M for Manet. Only artists are ever likely to have seen these links because conventional observers are so certain that the figures look like croquet players that they think they are croquet players. Art is not so simple because all its images are images in the artist's mind and not in the real world. It is art history's #1 misunderstanding. So, remember, become familiar with an artist’s early passions and don’t be fooled by appearances. 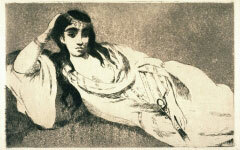 This etching of an Odalisque by Manet could easily be interpreted as just a variation on a popular theme, an oriental woman reclining. Look carefully, though, and she becomes a painter. Original Publication Date on EPPH: 03 Nov 2010. © Simon Abrahams. Articles on this site are the copyright of Simon Abrahams. To use copyrighted material in print or other media for purposes beyond 'fair use', you must obtain permission from the copyright owner. Websites may link to this page without permission (please do) but may not reproduce the material on their own site without crediting Simon Abrahams and EPPH.